On August 4th, I judged pork during the day and wine at night. I had the fortune of a friend referring me to the judges team for the The Columbus Food and Wine Affair. To serve as a judge, I had to attend a class on wine judging run by coordinator Rob Somers from Fosters Wine Estates. Rob has been with the Columbus Food and Wine Affair since it launched 7 years ago. Only two wine festivals in the US require judges to take a class prior to judging for the event – the other is the Cincinnati International Wine Festival. Having this standard for judging is important to maintain credibility. Evaluating something that is mostly subjective – such as wine – an event needs to ensure everyone is on the same page. This approach to judging is similar to the training I had to be come a Kansas City BBQ Certified BBQ judge. Note to self: avoid judging BBQ when I will be judging wine a few hours later. This is a system summary. Each wine has the potential for 20 points. Here is the breakdown of scores. 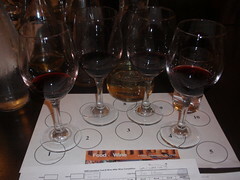 The approach to judging is to sample each wine on its own as objectively as possible. The 10 judges in training scored close to each other for each wine and our scores lined up within Rob’s range – a good sign. This is especially important since we will be judging 70 – 80 wines in each of our tasting teams. Awards will be presented to the winning wine makers for the Food and Wine Affair on September 25th. I did attend this event in 2008. Tickets were $100 last year but I am certain I consumed that much and more in food, wine and entertainment. It is held at the Franklin Park Conservatory which is a great venue for any event of this stature. The food part of the affair comes from some of out best local restaurants. Proceeds from the event go to charity so you can have fun at the affair with no guilty conscience. This entry was posted on August 4, 2009 at 10:53 PM	and is filed under events, wine. Tagged: Columbus Food and Wine Affair. You can follow any responses to this entry through the RSS 2.0 feed. You can leave a response, or trackback from your own site.